Dude. Are you people, like, VINYL or something? Daigo (Lumedoll Tyl, just arrived today) meets a few of the Tonners and clearly wishes he hadn't. The Tonners feel much the same way, though Kyoko on the right, there, looks intrigued in spite of herself. I love me some Lumedoll, that I do. I've been watching Eva's minis for a while, and this new group really grabbed me. The disgusted way he looks at the Tonners absolutely cracks me up. Duuuuuuuude. Eeek, he is so cute~!!! I think I wants one O.O; What a darling hoodie too. Lumedolls are AWESOME--so well-balanced and well-sculpted. And the little ones are just as impressive as the bigger ones (maybe more so, because of the delicate engineering involved at 45cm). 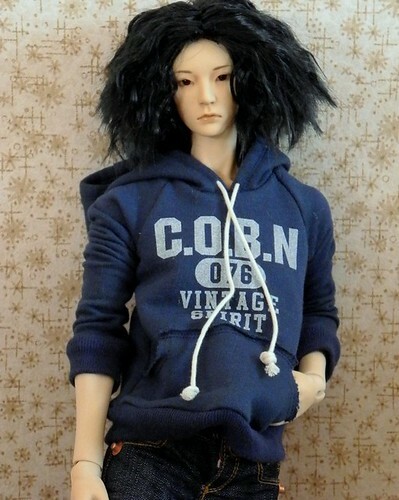 The hoodie is from TTYA.com (so are the jeans he's wearing). Great stuff, quick shipping, all around fantastic! I had no idea Tonners were that big! One of the things I really like about the Tonners is that they're big enough to "register", both in person and to the camera. Plus, their clothes and shoes are big enough for me to handle without always using a magnifying glass and tweezers, heh. I have several 1/6 dolls (momoko, Volks WTG, etc. ), but they're so tiny that it's fiddly to mess with them. 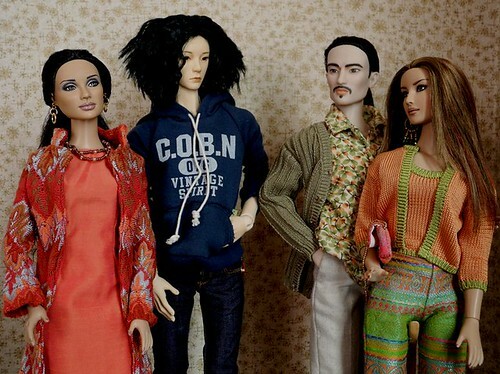 I don't know how 1/12-scale dollhouse people do it! Lumedolls are terrific to handle, too--I really love their weight and balance. I don't think Eva gets nearly enough recognition for the quality of work that she does! Isn't he?? I'm in lurve with the pocket Adonis!!! Dang I hope I'm not doomed now. Now I'm wondering if he would look too old next to other MSDs. Wish you were closer so I could see how Mikey looks with him. He does seem to have a face that could work for a younger guy or an older guy. I AM doomed, so c'mon and join me in the abyss! And I'll line up some minis (Unoa boy and girl, MSDs) for pictures later today--I'm wondering how they'll all look together, too. My guess is that Tyl will look like a different species, with his mature proportions, but it's always worth a try. Oooo, and I should put him next to the CED ladies too, just for kicks, though they'll probably dwarf him. Awwwww, happy holidays to you, too! And I'm a big Lumedoll evangelist--they're just fabulous, in every size. I'm much too amused by the idea of the Tonners getting together and making little vinyl meeping noises of disapproval. It's like I always imagine the Sasha dolls huddling in a corner and whispering about the strange resin people who have invaded their space . . . He's tiny and so cute!!! So much love for these guys! He's great! Did Lumedoll do that face-up? I am so, so glad I ordered him! He has tons of presence in person, but then I think Lumedolls always do. Yup, that's Eva's faceup, and the details are really subtle in person--I just failed at taking decent pictures yesterday. Eva just gets better and better with time. Away from the Tonners, he just looks neutral-shading-into-serious . . . but as soon as I put him on the table with them, he got this ARE YOU KIDDING ME?? expression. Cracks me up. Bwaahaaahaaaa,he certainly has that "wtf" look! I love his face. That size isn't for me, and I've pondered her larger dolls, but I don't like the larger faces as much as the smaller. I had the same problem with the Narindolls. LoLz, he really does look very cool, clearly too cool for the others. It's amazing how dorky the Tonners look next to him . . . even Ponytail-and-Facial-Hair Yoshio, who's about as cool as a Tonner guy gets. *snicker* I guess this is an argument for not mixing species, huh?